President Ishikawa was interviewed on the development of Wire Mesh Origami "Fabric Metals ORIAMI" for the "People" section of The Akahata newspaper. The developer of Wire Mesh Origami "Fabric Metals ORIAMI". The metal, which is flexible and thin enough to see through, can be freely bent and folded over. President Ishikawa is the third generation of a long-established company which has been manufacturing and selling wire mesh for over 90 years. They had been supplying parts to several manufacturers, but orders dropped significantly after the 2008 Financial Crisis which caused the manufacturers’ production to decrease. An impressive origami crane that an experienced craftsman made from wire mesh for fun left a deep impression with him and he took on the challenge of making it into a product. Under the supervision of the Nippon Origami Association, "ORIAMI" began sales in December 2015. "ORIAMI" workshops were held in various locations, fascinating both children and adults alike. Japanese origami is also very popular internationally. They have held exhibitions in countries such as Italy, France, and America and their deals with foreign countries have been increasing as well. The Akahata is a historical newspaper that is celebrating its 91st anniversary since its first publication on February 1st, 1928. This time, our company president was introduced in the “People” section. “Perseverance is necessary when turning an idea into a product. If you give up, that’s the end.” Along with this comment by President Ishikawa, the story of the development of "ORIAMI" was published. 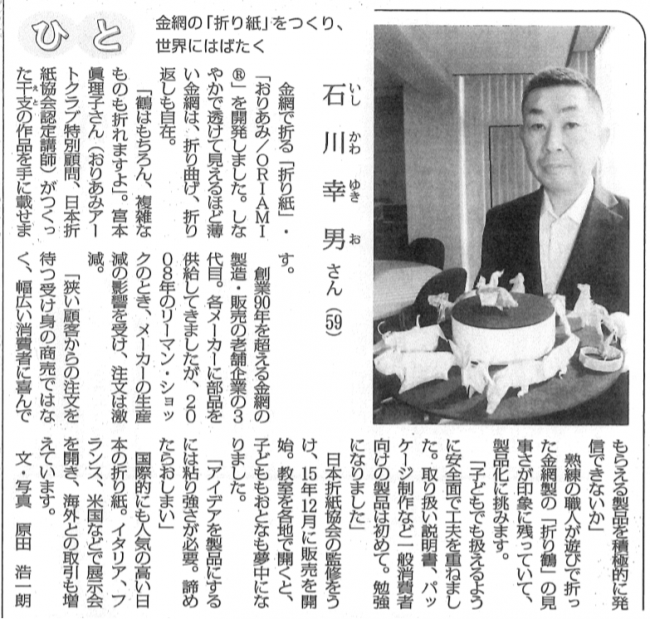 A picture of President Ishikawa with zodiac animals made with Wire Mesh Origami was also published with it. Please take a look at the efforts that were made to develop and promote "ORIAMI".